Packaging: The bottle is sturdy and comes with a small pump. The main color is white and brown. The packaging really reminds me of some medicine that you get from doctor hahahaha. But I really like the color combination between brown and white. It makes the bottle looks expensive (well, it is indeed expensive. The price for this eye cream is around IDR 680.000,00). I also love the pump type packaging. It makes the product more hygience than jar packaging. The pump also works well as I can control the amount of the cream that I want to use. So, this eye serum claims that it can reduce puffiness, dark circle, fine lines and moisturizing dry skin. On early June, After 1 month using this serum (and also after the eye peeling treatment) I can see my puffy eyes and dark circle reduced. The fine lines, it still there so I think I need to wait more longer to see the effect. As for the moisturizing effect, I found this serum really help to soften my under eyes area. I also love to use this eye serum before apply my eye makeup. I think this serum will works the best with the treatment. After 2 months (without the treatment), I still can't see any difference with my eyes. The main problem of course not in the eye serum, because mostly the problem is on my sleeping habits lol. Especially when I was away for my holiday, I was lack of sleep the whole time. Anyway, I personally think that using eye cream/serum since young is one of an investment especially if you always wear makeup. Once I saw a korean variety show, and saw a celebrity that already 35 years old but she still looks like 25 y/o, she then share one of her secret that she already use eye cream since she was 20. Sooo.. invest on your skincare especially eye cream, it maybe expensive but it sure worth the money if you keep using it for a long time. I got my eye cream from Miracle Aesthectic Clinic, head to their website for more information about this product. Recently Miracle also has new series called Miracle Series: Miracle Foaming Cleanser (IDR 200.000), Miracle Skin Solution (IDR 200.000), Miracle CC Cream (IDR 400.000), and Miracle Lashregro (IDR 600.000). 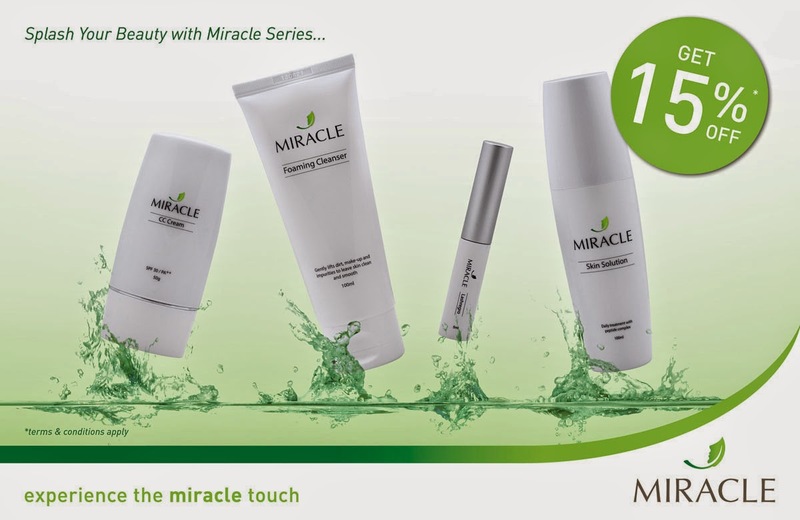 Good News~ get 15% OFF on the purchases of Miracle Series Until 31 August 2014! I can never tell when eye serums work or not because I always get lazy and end up not using it >.< But this does sound pretty promising! I have major puffy eyes and horrendous dark circles D: So maybe this product might help :) Thanks for the review!